DANI DAORTIZ RETURNS WITH A NEW SELECTION OF ASTONISHING MAGIC! 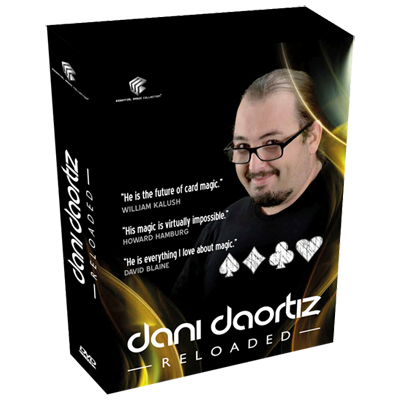 Dani DaOrtiz reveals the real secrets of professional card magic. From self-working miracles to psychological mysteries. Dani's routines are renowned for their entertaining plots and ingenious methods. A true card star. Dani DaOrtiz RELOADED is an English language 4 DVDs Box Set, subtitled in English, Spanish, French and Japanese. Shot in HD at the Estdio33 in Portugal by Luis de Matos Productions. "Simply super strong magic full of constant surprises!" "Dani is everything I love about magic." "His magic is virtually impossible"
"Dani is the future of card magic."